Wearable devices that record our every breath, heartbeat, step and bite of food are a rapidly growing category. But while we’re busy quantifying our health via various devices eventually comes the question of how one person gets a single picture of their overall health status. Health monitoring company Azumio thinks it has the answer with its new iOS(s aapl) app called Argus. Argus is free and available for the iPhone starting Wednesday. The app pulls in your health data from a variety of devices, such as the Withings scale and the MapMyFitness app, as well as other iOS apps from Azumio and others, and displays it all in a timeline of activity. It also uses the iPhone’s own sensors for information: it will record a user’s walking, running and biking pace and distance on a map. Another interesting feature that seems a lot easier than any other diet-tracking app is the food photo option. Argus users can take pictures of their meal, tag the food groups represented, and Azumio says the app will spit out data about the user’s eating habits — without having to input portion size or specific ingredients. The goal is to give users context about what these different sensors are telling you. Pressing on one of the data sources on your in-app timeline will automatically pick out other relevant sources of your health data and give you a read out with context about how they relate to each other. For example, you might know how many calories you’ve eaten, but how does that relate to the number of steps you’ve taken, and the number of beers you had last night? Azumio claims it will be able to bring all of this information together in a way that’s actually useful. 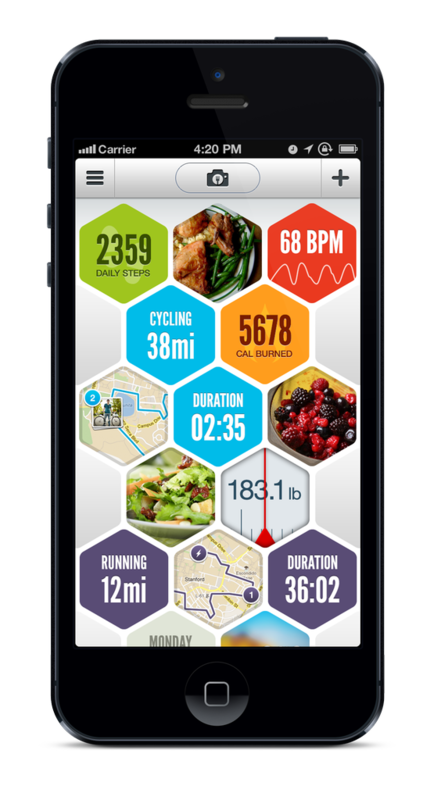 Argus is just the latest app from Azumio, which began building apps for both iOS and Android(s GOOG) to capitalize on the growing health-tracking trend back in 2011. In addition to the all-in-one Argus, there’s also apps for everything from stress management to glucose monitoring, sleep-tracking and general fitness. Just downloaded the app. I’ll see how it goes. How to track food? E/g take a photo of my Clifbar and it has all the details about it already? For a non-technophile like me it works fine as a start. I like the integration with the other azumio apps. I am frustrated that I cannot manually input my steps. The app step counter tallies steps while I am driving and is inaccurate. I wear a pedometer for better accuracy but cannot input the data into Argus and delete the Argus step count. Also, I cannot seem to go back an edit/add a missed comment for my food pics. Would like to see these features in next update. Does Argus integrate with Jawbone’s UP sensor? Great and very interesting blog. I think itâ€™s also an informative. Thanks for sharing. This will be cool if/when it can integrate ride/run data from Strava (and others). I’m not going to use Argus to track bike rides when a specialized device (Garmin) does it so much better, and I’m not going to upload ride data to multiple repositories, so it has to API it from Strava. The Wi-Things integration will be cool when it goes live. Right now the scale data goes into a silo where I never check it. All these services need to communicate with each other to be useful. And the alcohol feature is live! Thanks!! Indeed, let us know if you have any other feedback about ARGUS!